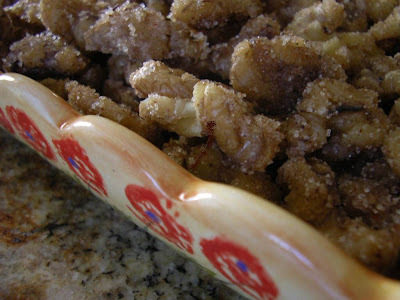 I was supposed to be making these spiced nuts to take on a trip this weekend, but I’m going empty handed. Seems I have a horrible tendency to underestimate the amount of stuff I can get done in a given amount of time. Am I stuck in this rut? Is it too late to change my ways? Why do I try to cram too much into a day (or week, or month, even years)? Renae got me turned onto spiced nuts at Christmas time when she shared a sampling of three different ways she’d spiced the nuts. I was planning to make the rosemary-ornage version for this trip. And when we visited Renae, Dan and Emma a couple weeks ago, a tray of spiced nuts had just come out of the oven. Heavenly aromas! And irresistible to taste, even (especially?) warm. This recipe, though, comes from The Teacher Cooks, who was inspired by Shutterbean. 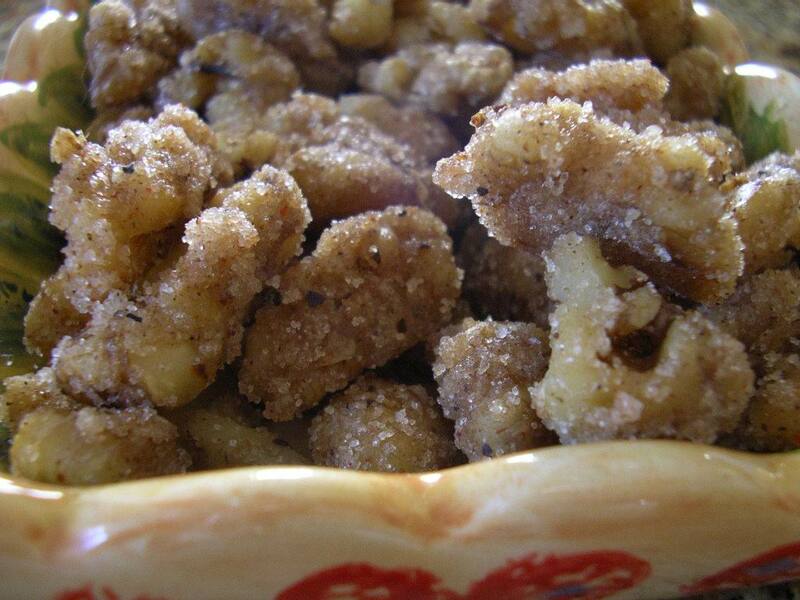 In a small bowl, mix together the sugar, salt, black pepper, cayenne, ginger and cinnamon with the maple syrup. In a large nonstick skillet, toast the walnuts over medium-high heat, stirring or shaking the pan constantly, until they are hot, about 5 minutes. Be careful not to burn. Immediately add the nuts to the maple syrup and toss to coat. Stir in the spice mixture until the nuts are evenly coated. Spread the walnuts in a single layer on a rimmed baking sheet. Let cool completely before serving about 20 minutes. Sorry to hear about your nut-free road trip. Boo! Nuts - no nuts!!! I too am a big fan of roasted glazed nuts. Here's hoping you have them for your next trip. I just signed up to follow your fabulous blog - please stop by and visit me sometime at www.theglamorousgourmet.com. Looking forward to your next delicious post - Cheers! These glaze nuts look so tempting and mouthwatering. Sorry about the "no nuts" for your road trips. I can eat the whole amount, its so addictive. Isn't that the truth - trying to do too much! These look wonderful and must smell soooo good. They'd be great for our hiking trips this summer in New Hampshire where we always have plenty of maple syrup on hand! These sound great!! Thanks for sharing!